The victorious DCU Women's Basketball side. Credit: Basketball Ireland Colleges. DCU Basketball delivered a double at the NBCC intervarsity event with both the women’s and men’s teams walking away with cup success. 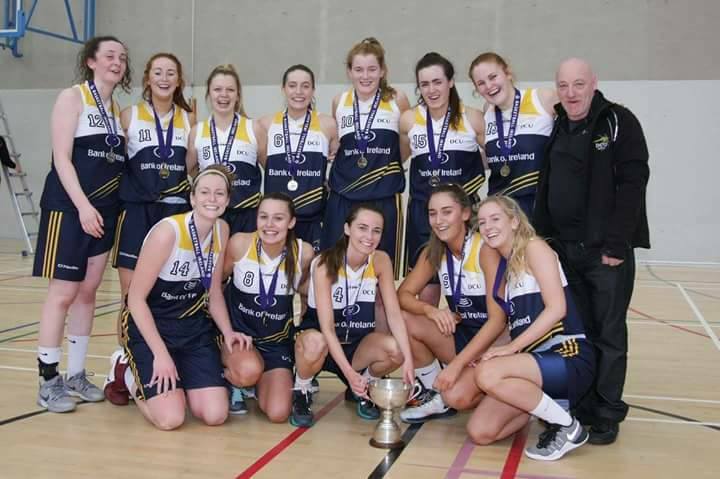 The women’s side became A Division champions, powering to a 69-61 win over Institute of Technology, Carlow, hours after the men’s side took home the trophy in the Men’s B final, defeating Institute of Technology, Tallaght 72-66. The women’s side raced into an early 6-0 lead, courtesy of an Aoife Maguire lay-up and two baskets from Sarah Fairbanks, and were able to control the game – save for an impressive third quarter comeback from Carlow, led by 32 points from Jamiyah Bethune. Fairbanks had a standout game, finishing with the MVP award and bagging 31 points – while a great team defensive performance, led by Megan Connolly, saw DCU ultimately hold back the impressive Midlands squad. The women also gained a measure of revenge in the semi-finals as, after losing out on the league title to Ulster University, they thwarted them 71-64 to set up the final clash – but not before the game went to two overtime periods before finally being settled. The men triumphed over Tallaght after another MVP performance from Andrew McGeever, who led the Glasnevin side in scoring with 22 points. The loss of Paddy Sullivan two minutes into the second quarter nearly put paid to DCU’s hopes, sacrificing an 11 point half-time lead as Tallaght’s Omar Arcilla and Aidan Dunne led the charge against the shaken side. Mark Grennell’s men, however, persevered and crucial late scores from McGeever and Conor Gilligan, who managed 13 points, and a dominating performance at the death from Donal Monaghan saw them defeat their Dublin rivals by six points.